Seawater has been leaking into the nuclear condenser at the Olkiluoto 1 nuclear power plant in Eurajoki, western Finland. The plant’s output is limited as Voima undergoes fault identification and repair. Energy production at Eurajoki’s Olkiluoto 1 reactor has fallen due to small volumes of seawater leaking into the nuclear condenser. The plant’s owner, Teollisuuden Voima Oyj (TVO), says that it is working to locate the fault. The task of locating the leak and initiating subsequent troubleshooting and repair means that the plant’s output is limited to 300 megawatts. The plant is estimated to return to full production by Tuesday morning. The leakage was found when the nuclear reactor’s electrical conductivity was measured. The leaky condenser block has already been separated from the production process. The leak is said to be quite small, letting in a trickle of some two litres per hour. The role of the condenser is to cool the steam generated in the nuclear reactor, a process which involves the use of seawater. It’s expected to take around 8 hours to repair the fault. According to TVO the leak does not pose a safety risk. A former nuclear industry safety official has written a novel based on his fears that it would become easier for terrorists to cripple the UK if the Government gives the go-ahead to big infrastructure projects such as Sizewell C.
Barrie Skelcher was head of the health physics department at Sizewell A during the 1960s and 70s and went on to become technical officer at Sizewell B. His novel, The Day England Died, is due to be published by the Book Guild on April 24. It tells the story of a group of terrorists planning an attack on a nuclear power complex – by blowing up the pylons connecting it to the grid and disabling emergency generators which could be used to help cool the reactors and prevent a Fukushima-scale disaster.. Although the name Sizewell is not mentioned in the novel, the terrorists base themselves in Suffolk 20 miles from a former fishing village where there is a nuclear site. In the novel it is called Deephole and is close to a town of 7,000 inhabitants called Munchington. Mr Skelcher, who lives in Leiston and is a sailing enthusiast, started his nuclear industry career working for the UK Atomic Energy Authority at Dounreay in Scotland in 1954 and took early retirement from Sizewell B in 1987. “As power is being imported at Sizewell from offshore wind farms another power station there would be putting too much power in one place,” Mr Skelcher said. “My guess is that terrorists will try to better the Twin Towers attack but deploy different methods. An EDF Energy spokeswoman said the company could not discuss security but acted on all recommendations and instructions from the Office for Nuclear Regulation. “The Civil Nuclear Constabulary is deployed at all EDF Energy nuclear sites to further enhance the already robust security arrangements. These officers work alongside existing security teams at each station,” she added. Kiev crisis halts Chernobyl charity’s €3m surgery plan – Children at risk! AN IRISH humanitarian aid agency has been forced to cut its €3m heart surgery programme for the children in Chernobyl due to increasing riots and violent demonstrations in Ukraine. 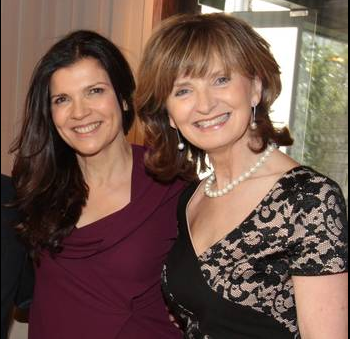 CEO of Chernobyl Children International (CCI), Adi Roche, said the decision to put the programme on hold was “deeply distressing”, and that the impact of this may mean even longer waiting lists for vital-life saving operations. Ahead of today’s EU Foreign Affairs Council meeting in Luxemburg, Ms Roche, has spoken with EU officials to see whether or not humanitarian funding can be made available to the programme at this time of crisis. The €3m spent so far on establishing and maintaining the programme has been raised entirely in Ireland by CCI donors and volunteer fundraising activities. All operations that had been scheduled for the next month at the “open heart” surgery programme in the Regional Hospital in Kharkiv have been suspended until the situation stabilises. Ms Roche said the reality is that one in every four children diagnosed with the ‘Chernobyl heart’ will die before they reach the age of six. She said this means the “programmes we organise and fund each year are really a race against time”. She stressed that the situation between Russia and Ukraine was so serious the surgery programme had no choice but to temporarily suspend all procedures, but that “teams of surgeons” are standing by in the US and Canada “waiting to travel”. For the past 10 years, the programme has been treating a significant portion of the 6,000 Ukrainian children born with genetic heart diseases every year. Many of these conditions, known as the ‘Chernobyl heart’, have been linked to the radiation leaks from the Chernobyl nuclear plant accident in 1986. TOKYO — When Yasunari Kawabata became the first Japanese to receive the Nobel Prize for Literature in 1968, he gave a speech called “Japan, the Beautiful, and Myself” that presented a benignly aesthetic portrait of the so-called Japanese spirit larded with references to classical poetry, the tea ceremony and ikebana. When Kenzaburo Oe received the prize in 1994, he titled his lecture, “Japan, the Ambiguous, and Myself,” and offered a critical take on the country’s ambiguities, starting its being part of Asia and simultaneously aligned with the West. Although Japan does not have nuclear weapons, it has a nuclear weapons policy. The strategy was set out by the Ministry of Foreign Affairs in 1969 in an internal document whose existence was kept secret until the daily Mainichi Shimbun published it in 1994. That paper states that “for the time being we will maintain the policy of not possessing nuclear weapons” but also “keep the economic and technical potential for the production of nuclear weapons, while seeing to it that Japan will not be interfered with in this regard.” Known as “technological deterrence,” this posture is inherently ambiguous, and has been made more so still by the ministry’s insistence that the document was a research paper rather than a statement of policy. In a 2000 essay about the future of the Nuclear Nonproliferation Treaty, the disarmament advocate Jonathan Schell drew a distinction between capacity and intention in describing the range of positions states may adopt on nuclear weapons. At the time, Sweden had the capacity to produce such weapons but not the intention; Libya had the intention but not the capacity. Japan, by contrast, stands out as the only nation that has both the capacity and the intention to produce nuclear weapons but does not act on its intention. It has pioneered a type of nuclear deterrence that relies not on any overt threat, but on the mere suggestion of a latent possibility. 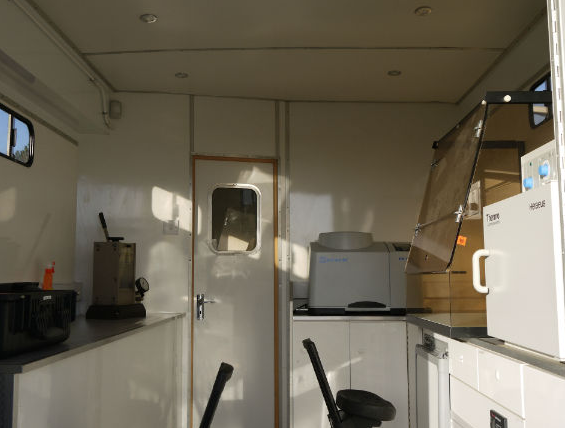 UK National Physical Laboratory (NPL) and Loughborough University are setting up a demonstration mobile radiochemistry laboratory that can be driven onto a nuclear site. Field tests are expected later this year. Work to decommission plant, buildings and contaminated land on legacy nuclear sites relies on accurately determining the activity concentrations of specific radioisotopes in the materials, so that demolition and waste disposal can be carried out safely and in compliance with site licence conditions. Equipment and expertise for the complex measurements needed for decommissioning samples are the province of a small number of specialist analytical laboratories. As a result, these laboratories can be over-burdened with work, leading to long turnaround times of up to several months. The laboratories are also off-site, so radioactive samples often have to negotiate a time-consuming permitting and administrative process before they can be sent off for analysis. As measurement results lie on the critical path for decommissioning projects this can lead to long delays, with the project team waiting for the results from the analysis before work can start on demolition or disposal. The UK National Physical Laboratory (NPL) at Teddington has joined forces with Loughborough University’s radiochemistry section to develop a solution to this problem. 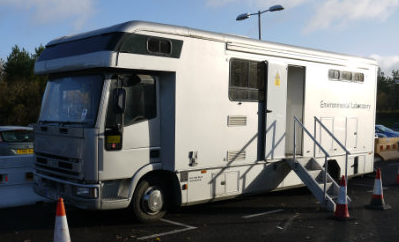 Thanks to support from the Department for Business, Innovation and Skills and the EC, NPL and Loughborough are setting up a demonstration mobile radiochemistry laboratory that can be driven onto a nuclear site. Samples can be taken directly to the laboratory and the results from the analysis will be in the hands of the project manager within hours rather than weeks. If the results show that further samples are needed, they can be arranged immediately, which is far preferable to repeating a long cycle. 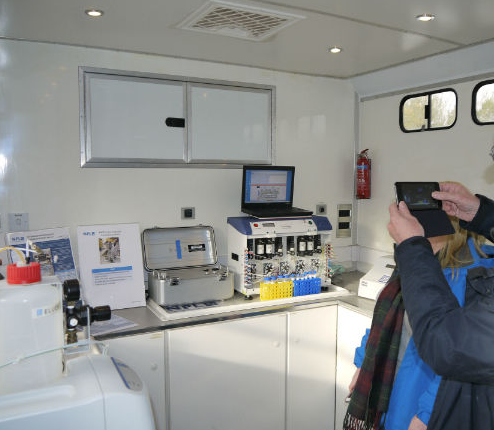 A mobile laboratory also has the advantage that it can carry out essential measurements of routine discharges in the event that a site’s own laboratory is out of action. The vehicle was designed by the British Geological Society and is the property of Loughborough University. The vehicle itself is reconfigurable and has its own independent power supply and utilities. Equipment needed for a particular analysis campaign can be rapidly installed, and removed or replaced as required. Two technicians are needed to operate the installed analysis and measurement systems, with wireless data transfer to the NPL-Loughborough support team for further analysis and reporting. The mobile laboratory has two distinct areas: one for sample preparation and the other for analysis and measurement equipment. The latter may include a high-resolution gamma spectrometer, a bench-top scintillation detector, portable radon gas detectors and non-nuclear measuring equipment such as balances and x-ray fluorescence (XRF), x-ray diffraction (XRD), SEM or GC-MS. The mobile laboratory has become a realistic proposition only in the last five to ten years, due to technological developments such as automated radiochemistry. Lawyer Yabe, Ms.Shimotani and friends target Mari Takenouchi in a disgusting campaign of hate and sexual abuse! With no comment from the ETHOS child killers! Some days ago, a Kyoto resident, Mr. Koichi Hosomi who has been continuously harassing Mari Takenouchi sometimes in combination with the lawyer Yabe sent the following tweet. I, Mari Takenouchi-is a freelance Japanese journalist. 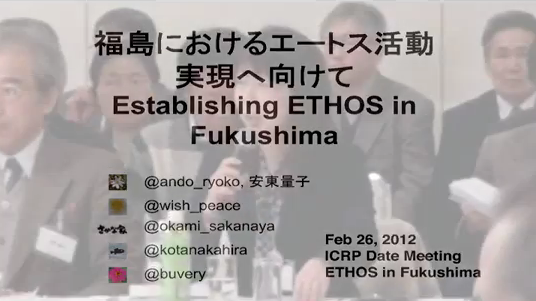 I have been supporting ideas that are designed to save children of Fukushima. Thus, my main targets have been UN agencies, the Japanese government and the Fukushima ETHOS group. (Though, some people have laughed at me, a single mother for challenging these organisations).. Accordingly, lawyer Yoshiro Yabe who has been harassing me on twitter, is not my actual target at all. However, since his harassment has been malicious and continuous, I talked today with the vice president of Kyoto Bar Association, Lawyer Kenji Akiyama. I talked to another lawyer in Kyoto Bar Association, but the situation has not been dealt with by this person at all. I asked Mr. Akiyama to notify Mr. Yabe regarding the 6 points I informed him of. However, as I spoke, my voice became spontaneously loud with rage. I added my apologies to Mr. Akiyama who had heard my angry tone of voice. As I write this blog, Mr. Yabe is making an excuse saying that his initial advice on my petition (to be forwarded to prosecutors not to indict me) was actuallyfor the sake of me. This was a blatant lie. Please read 6 points I offered below..
1) The bar association told me the procedures to apply for the disciplinary dismissal of lawyer Yabe. However, he was slandering me for tweeting this mere fact that the dismissal procedure was given by the lawyer to Mari Takenouchi. He insisted that I was creating my own scenario in which there is a possibility for Lawyer Yabe to be dismissed using disciplinary procedure. “Disciplinary dismissal is the same as criminal accusation for a lawyer! I will resort to every means to fight back.” in a panicked manner. Yet, he himself has continuously harassed me, a single mother, who is suffering criminal accusations. His deeds seem to be contrary to ethics and morals, not only as a lawyer, but also as an individual. So on April 10th, I asserted damages of radiation on children (from ETHOS) using scientific arguments. She had been continuously been harassing me for some time even before April 10th.